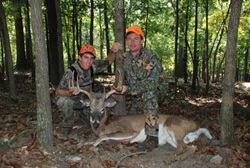 I am sending you a picture of the beautiful 150 class Whitetail my son harvested in early October of this year. My son is a Senior in High School and I wanted to treat him to a fun time in the woods. We told our guide, Monty, the quality of animal we were after and he did everything in his power to ensure a successful hunt. The only thing that even approached the fun we had in the woods was the magnificent food prepared for us in the lodge! Every meal included some type of wild game and was prepared to perfection. I want thank you and the staff for your part in a most memorable Father/Son experience. I just wanted to send you a couple of pictures from Alex’s Hunt. We had a great time, Justin our guide was great and the Deer was awesome! The trip was a trip of a lifetime. We hope to make it back to hunt again soon. 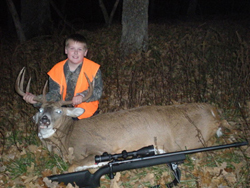 My son John's first out of state Whitetail hunt turned out to be perfect. 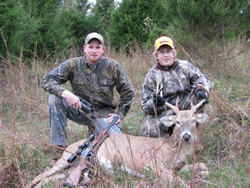 I imagined all sorts of worse-case scenarios like shooting penned deer or the guide rushing you to make a kill. What a relief, John's guide, Bart, was a perfect match for his personality. We were never ever hurried and it seemed like Bart's #1 job was for us to have a great experience. And as far as the hunt itself, very challenging. The rugged terrain and hills made it easy for the deer to catch our scent and mover over the next hill. I've successfully bagged many Wisconsin buck, usually just sitting in a blind and waiting, but this was a real treat!